“Wasting beneficiaries’ money is imprudent. In devising and implementing strategies for the investment and management of trust assets, trustees are obliged to minimize costs” (National Conference of Commissioners on Uniform State Laws). Types of Fees: To put it in the simplest terms, there are only two types of distributions that are made from a trust: those made to directly support the beneficiary and those made for other purposes. The latter class of distribution, those that do not directly meet the trust purposes, are “costs” or “fees” associated with the administration of the trust. These fees can be further organized into two classes: those paid to the trustee for the services they provide as they occupy the office and those paid to third parties who have been delegated management or other administrative functions. 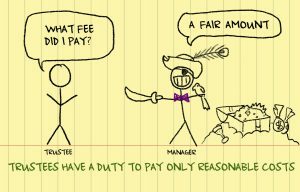 Delegate Fees: In deciding how or what functions to delegate, the trustee must take costs into account. The role most frequently delegated by a trustee is the day-to-day management of the trust assets. At the time of the delegation and periodically throughout the relationship, a trustee is obligated to confirm that the fees being paid to the investment manager are reasonable and consistent with industry norms. This can be done by periodically gathering the fee schedules of other investment managers who provide a competing offering to the manager the trustee is currently using. A thorough fee analysis would include not only the fees the trust pays to the manager, but also the fees the trust incurs for the products or sub-managers among which the trust capital has been deployed. Trustee Compensation: A conflict arises when the trust document is silent, as most are, about how much the trustee is to be paid. The matter is further complicated when the trustee is a professional (like a CPA, attorney, or investment manager) who not only is appropriately compensated for their role in administering the trust, but also provides professional services to the trust. The Uniform Trust Code, adopted by most states, gives specific guidance for fee disclosures that trustees are to make to the trust beneficiaries when the trustee wears multiple hats as the chief fiduciary and as a service provider to the trust. Developing a record of what the trustee decides to pay themselves and a rational basis for that fee amount is a critical risk mitigation discipline. Procedural Prudence: A prudent trustee acting in good faith will create a record of who is being paid what and by whom. In many cases a simple “fee study” will suffice to create this record that the trustee both (1) recognizes this duty to incur only reasonable costs and (2) has taken proactive steps to fulfill this duty.